The Imagine Team - L-R Dawn (costumes), Ian (Stores), Steve (M.D. ), Phil (Stores), Louise (Production Assistant) and Iain L (Creative). Sarah is taking the photo. It's the first pre-production meeting of the 2011/12 pantomime season. 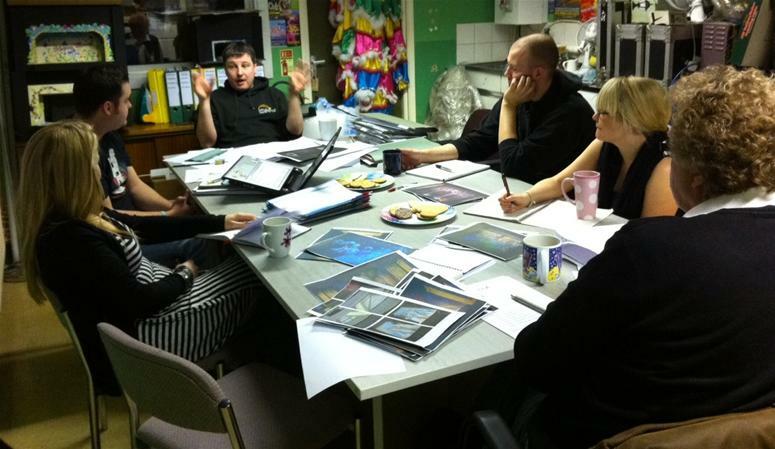 During this meeting we're working through all eleven of our 2011 pantomimes, planning sets, costumes, props, special effects etc. The actions from this meeting will form the bulk of our work for the next 6-8 weeks until we have our next big meeting like this.